When you can’t fit an extended overseas trip or a long weekend jaunt into your jet set schedule, what’s the next best thing? Take a mini vacation close to home! Filled to the brim with tourists and business travelers alike most days of the week, Washington DC has no shortage of aspirational hotels or celebrated restaurants. We found both at the Park Hyatt Washington and the Blue Duck Tavern. As Hyatt enthusiasts, the Park Hyatt Washington had long been on our list. After all, it’s in our backyard. Plus, we had heard phenomenal reviews of the hotel’s restaurant, the Blue Duck Tavern, which offers a special gluten-free menu. What sealed the deal was learning that we could book through American Express Fine Hotels & Resorts, which offered both breakfast and a $100 dining credit at the restaurant. Breakfast AND dinner at the Blue Duck?! Our Hyatt Diamond membership ensured that we would be able to snag a dinner reservation at a decent time, giving us just enough time to check into our room, test out the hot tub, and get changed for dinner. We entered the restaurant through the pastry kitchen, and the impeccable service began right away, as I was presented with the evening’s gluten-free menu. Our server knew the menu backwards and forwards and was easily able to answer any questions about ingredients and preparation. My only complaint? The lighting was lovely but made photography really difficult! 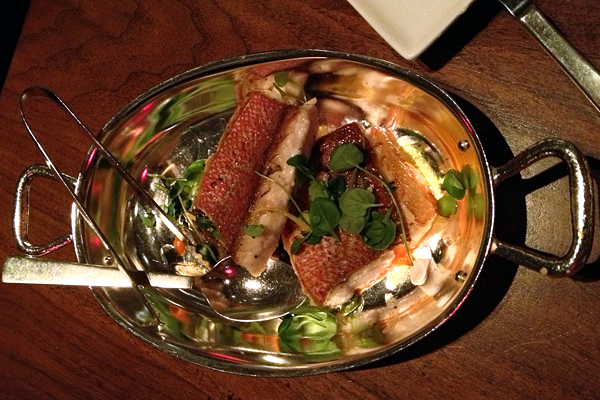 We opted to focus on Blue Duck’s seafood and went with the seared scallops and crispy skin salmon. It’s tough to blow me away with scallops, but these did. 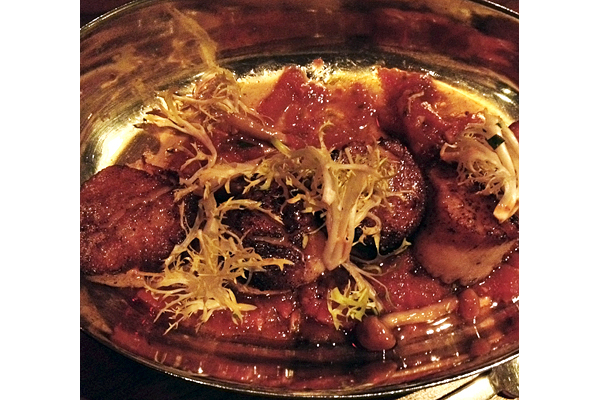 Perfectly seared, yet still tender and juicy, the scallops paired well with the caramelized mushrooms. The crispy skin salmon was similarly delicious, only made better by the decadently creamy garlic potatoes that we ordered on the side. While dessert wasn’t necessary, this was the Blue Duck, and after all we did have a $100 dining credit to use. 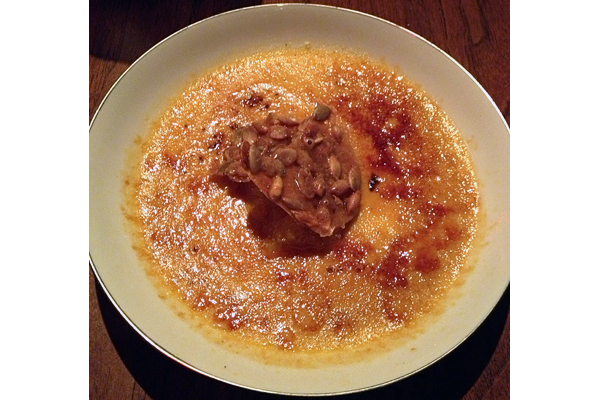 I couldn’t resist the pumpkin crème brûlée, which was topped with pumpkin seed brittle. Not only was this the best, richest, and creamiest crème brûlée I’ve had, it was also the largest. Of course I ate every bite. Making the short trek upstairs to our room at the Park Hyatt, we finally understood why the small elevator featured a large bench. People this full of delicious food cannot be expected to stand upright! The next morning, we geared up for breakfast by taking a walk around the Park Hyatt’s Foggy Bottom neighborhood, and when we returned to the Blue Duck, we were relieved to see that the breakfast portions were on the small side. 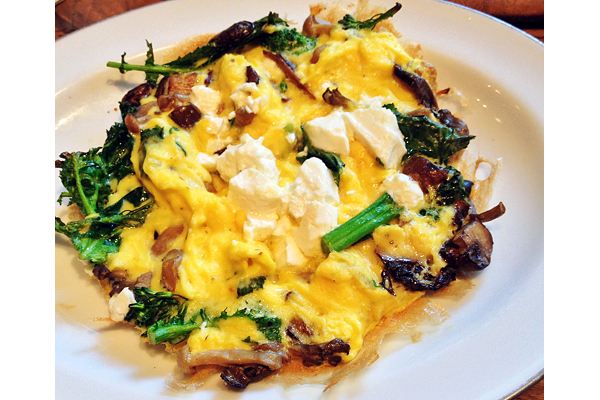 Gluten-free breakfast choices were somewhat slimmer than the dinner choices, but the frittata, packed full of tasty goat cheese, mushrooms, and asparagus, was a winner. On my next visit I would love to see gluten-free breakfast pastries on the menu. Where? The Park Hyatt Washington and the Blue Duck Tavern are located in Washington DC’s Foggy Bottom neighborhood: 1201 24th Street NW, Washington, DC (202-419-6755). « Wicked Waffle: Washington, D.C.